I didn't have a wedding ring the day we left LA to drive up North for our wedding. I put lots more planning into take home CD's and plastic animals for the tables. Jeremy and I packed up each of our cars and, even though he had to drive to Echo Park to pick up his friend, he was still ahead of me by, like, 2 hours. I got as far as Glendale when I realized I had just enough money in my account for gas and...that was about it. I pulled over at the first jewelry store I spotted and this suave George Hamilton looking fellow stopped chatting with a customer and glided over to ask if I needed help. I said, "I need a silver wedding band," and I could see the dollar signs flash in his eyes. I had said the magic word. So I followed it up with, "And it has to be under $100." He frowned slightly. "And preferably under $50." He turned away and said, as he walked back to the previous customer, "I'll get our trainee to assist you." I didn't even get someone with a name. Anyways, Trainee was great and she found me my bottom shelf wedding band for $19.99 and I was back on the road. Problem is, while I love it because it's what I got married with, it's a bit of a snoozer. 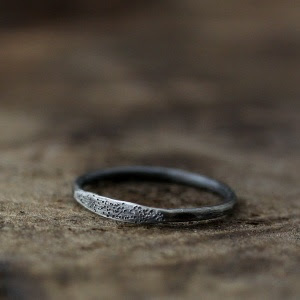 I'm contemplating a tradesies with this signet stardust ring from Andrea Bonelli. This way, I can keep ol' trainee ring in a box for safe keeping. I think it's justified.